I have some background in acoustics, and air passing through the fireplace throat reminds me of the languid opening on a pipe organ's flue pipe. See http://en.wikipedia.org/wiki/Flue_pipe. I suppose an (im)properly shaped throat could cause a fireplace to announce like an organ pipe under certain conditions. 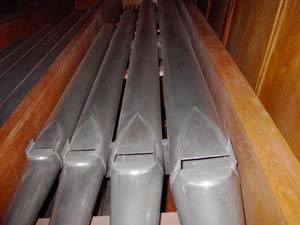 The comparison of our Rumford throat to a pipe organ flue is interesting. I have had several customers complain about the Rumford "whistling" in the wind. That's probably why. Think of a penny-whistle or a recorder (and recorders are available in several sizes) - the length and diameter of the tube controls whether there are standing waves in the instrument or not. The shape of the tube (increasing or decreasing diameter, bubble chamber at one end) influences the harmonics that are supported, and thus the shape of the sound. When a note is played, every instrument plays that note but also sounds at certain other harmonies. Trumpets and trombones, which have a constant tube diameter (until you get to the bell), support sound in the 4ths and 5ths of the scale. Clarinets and saxophones have tapered tubes and support the 3rds of the scale. The size and shape of a smoke chamber might influence the sound quality of the chimney-as-musical-instrument. But I doubt that the existence of a smoke chamber will cause the chimney to whistle. I think the whistle is a happenstance result of the combination of the height and internal dimension of the flue. It is probable that all chimneys make a sound, but we usually can't hear it. In the whistling chimneys, my guess is that the homeowner is not hearing the primary sound, but rather some upper harmonic of that base note, which happens to be within human hearing range. And I think the sound is generated by wind across the top of the chimney, like blowing across the top of a Coke bottle. I have heard a number of fireplace chimneys that, under certain wind conditions, go houff houff houff, at about 80-100 cycles per second. This is the Coke bottle effect, and it is producing sound waves, but at a frequency that you would feel, not hear. With the right breeze across the chimney top it may support the harmonics that also produce a whistle within hearing range. My present house came with 2 fireplaces, a squat rectangular masonry box and flue and also a metal box with metal flue. They both have screen spark arresters at the top, but the metal chimney occasionally sounds out with a houff houff anyway. Gets the dog barking.